Applicable Age: Above 6 years old. Product Function: Can be used as the long gloves, woolen bag, scarf and socks. We will deliver the two coils of woolen yarn (complimentary) in random colors. Young children please use under the supervision of an adult. 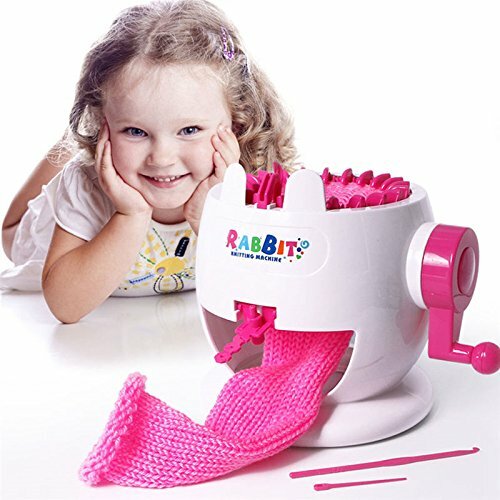 Easier than a traditional knitting, the knitting machine features simple operation and quick learning and is intended for adults and children. ❤If you have any questions, please feel free to contact us. ✧ Features-Discover the delights of knitting. Knit your own scarf, hats, and even a sweater with this knitting machine. Just thread the yarn into the spindles and turn the crank to knit your very own scarves, hats, or sweater. ✧ Package Included-A set include Armrest * 1, Woolen yarn organizer* 1, Knitting machine * 1, Manual * 1, Crochet needle * 1, Plastic needle * 1, Woolen yarn* 2(Color Randomly). ✧ Convenient-With its larger diameter, you can create even more personalised knitted pieces with a few turns of the hand. Hand crank operation needs no batteries, Create a flat or round stitch in seconds. ✧ Suitable for Kids and Adults-Ages 6 and Up. As long as gently shake the handle, you can easily weave a beautiful hat, scarf and more. ✧ Perfect Toy for Children-This product can stimulate children's interest in new things, so that the children themselves to stimulate innovative thinking! Through the operation of the knitting machine, can improve the child's coordination ability and imagination ability.